I used very simple tools to compose this. The 2cm diameter keychain was coiled with fine silver color's copper wires, and then I slowly coiled the tiny shiny freshwater-pearls to the base, and lastly, I added a 12mm sparkling Zircon round beads for finishing. As bonus, I coiled the 2mm jumprings with wire too, it's very challenging since the jumprings were so tiny, but look what a pretty composition! 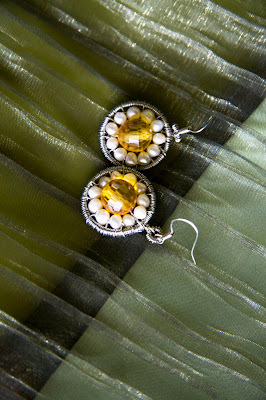 The earrings focal measures 1.5" from the bottom of the ear-wire. Note: Please check out my etsy store for more products.